Just installed Excel for iPad. I have an iPad 2 running iOS 7 and installing Excel from the App Store went quickly and smoothly. Opening Excel on the iPad for the first time, I found the user interface clean and intuitive. After playing with it for a few minutes, here are my first impressions. The insert ribbon contains commands to insert tables, charts, pictures (from the iPad Camera Roll), shapes and text boxes. It even shows a button for Recommended Charts. The Charts button has every familiar Excel chart that you know from the full desktop version. the Formulas ribbon contains buttons for the different formula categories and a little calculator icon on the right to recalculate the sheet. When a table, chart, shape etc. is selected, a context sensitive ribbon tab appears with an impressive array of commands for the selected item, including styles, colors and much more. Although data validation and conditional formatting cannot be defined on the iPad (as far as I can see), they work great if a file already has conditional formats or data validation set up. If named ranges have been defined in a workbook, these work in Excel for iPad and they can be used to create new formulas on the iPad. Excel for iPad supports freezing panes, either first row, first column or both. I added some data, created a table from that data and created a chart from the table. Added a shape, moved the data validation cells to a different position, changed numbers in the conditionally formatted ranges and added a new formula using named ranges and the =Formulatext(C13) to show the formula I added. Here is what it looks like with the data validation drop down opened. The screen is overlaid with grey and the data validation box really stands out. VBA and external data sources are not supported in this release. When opening a file that contains VBA or links to external sources, a friendly message appears that informs the user, but after that the file will open fine. Overall, I am very impressed with this Excel experience for iPad. 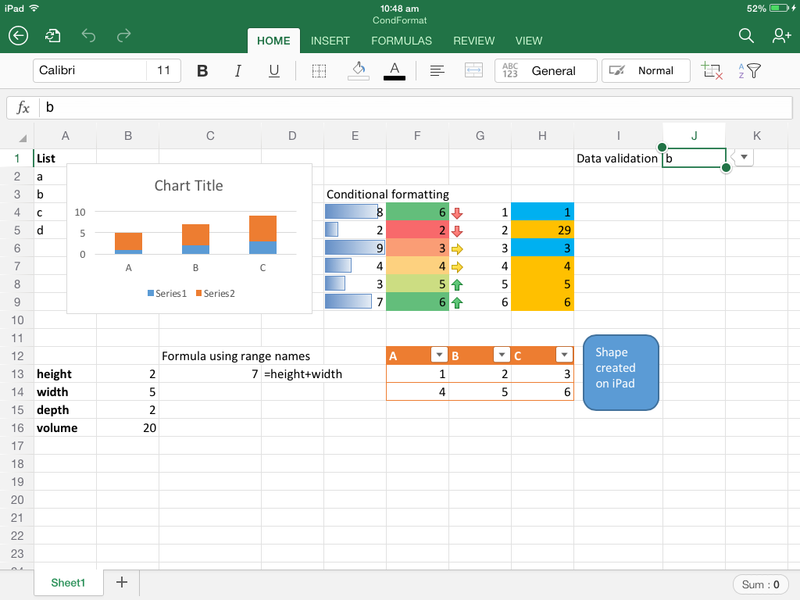 You would not want to create complex models from scratch using just iPad, but it is now possible to take your Excel files with you, store them on your iPad and work on them off-line, doing more than just simple data edits. 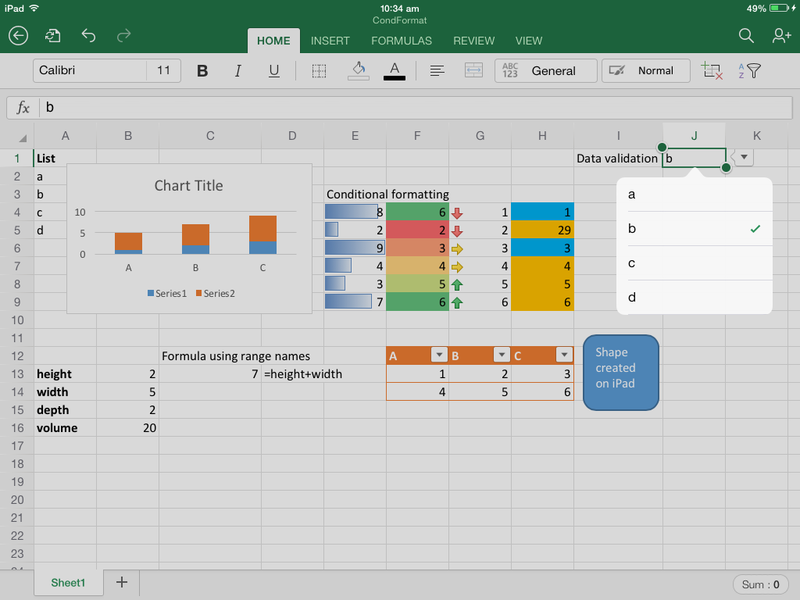 Addendum Sunday 30th March 2014: This review is a very quick recap of how Excel for iPad deals with some of the most frequently used Excel functions. Bill Jelen, aka MrExcel has a review inspecting much more comprehensive scenarios here. Next Vlookup – why do I need TRUE or FALSE? I am finding the drop down menus are limited to about 16 characters. Has anyone seen a setting where this could be expanded?